No. 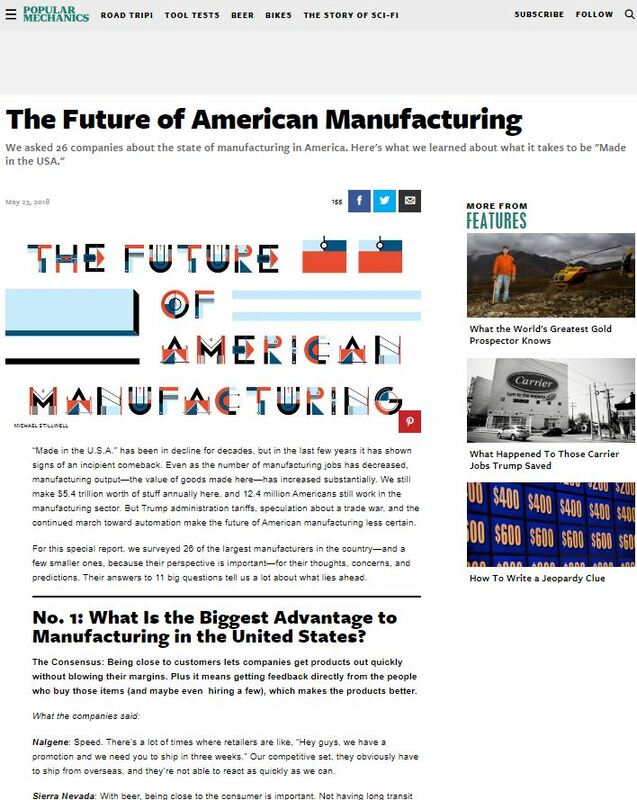 1: What Is the Biggest Advantage to Manufacturing in the United States? The Consensus: Being close to customers lets companies get products out quickly without blowing their margins. Plus it means getting feedback directly from the people who buy those items (and maybe even ­ hiring a few), which makes the ­products better. Glebar: The collection of people we have over here from all over the place, with different experiences, and there’s a lot of sharing of information. So there’s this kind of dynamic creativity that happens here that you don’t see at many other places in the world. This encouragement to think out of the box and just completely go for it, it’s an inherent American thing. It’s this hunger. There’s no fear in trying to push the envelope. Nalgene: Speed. There’s a lot of times where retailers are like, “Hey guys, we have a promotion and we need you to ship in three weeks.” Our competitive set, they obviously have to ship from overseas, and they’re not able to react as quickly as we can. Sierra Nevada: With beer, being close to the consumer is important. Not having long transit times, being able to control the routes to distribution. We ship our beer refrigerated. Doing that from a foreign country is pretty costly. Stihl: Manufacturing here gives us the ability to quickly and easily adapt to changing supply and demand and respond to the customer with new innovations. Polaris: It’s a tremendous workforce. Our 11,000 employees are crazy competitive. We’re also close to our customers: About 80 percent of our volume is sold here. Zippo: When we ship products into China, Europe, there’s a duty on it, there’s logistics costs. The quality has to be impeccable for customers to pay that premium value for the name. To try and develop that in Shenzhen, there’s just no way we could provide that level of oversight. No. 2: What Is the Biggest Challenge to Manufacturing in the U.S.? The Consensus: The skills gap—young workers’ lack of proficiency in traditional skills—is a problem. That, combined with the fact that labor costs tend to be significantly higher in the U.S. than abroad, makes developing a workforce harder than it should be. Glebar: The schooling. In the States, the mindset is, if you get out of high school, you have to go to college, whether you’re into it or not. The stigma is that manufacturing is dirty and it’s not technology-based—even though we’re using a ton of technology, and our work is a very good challenge for a lot of people. Fiesta: Our turnover is relatively high. We’re in an area of the country where manufacturing, by our view, is dying. There’s an ethane cracker plant being built about seven miles away from us, and they’re talking about building another 20 miles down the river. The younger labor force is going to go there—where the job is a little more lucrative, a little better paying. Plus, the cities we’re located near have gotten smaller as they got older. East Liverpool, Ohio—which is right across the river in one of the areas where we attract our workforce—used to have 25,000 residents. It’s more like 10,000 now. On top of that, we’re competing against companies using product that’s made in the third-world market that perhaps is made by people who are making low wages with minimal or no healthcare costs. For us, we live in a pretty decent area of the country. Our labor costs are not exorbitant, but they’re not at the low end of the scale. Something that’s not uncommon for just about any company doing business in the United States today is the runaway healthcare costs. Nalgene: Our cost structure is pretty good, but when you compare our costs manufacturing in the States compared to manufacturing in China, there’s no doubt it’s higher. Briggs & Stratton: We’re not always able to find employees to match the skill sets we need, so we work with high schools, colleges, and technician schools to help train our workforce. That’s not just a problem for us, it’s a problem for most manufacturers with U.S. operations. Filling the skills gap is important for the U.S. to compete in the global marketplace. (pictured above) Polaris provides training and equipment to local high schools. Polaris: The regulatory burden. It’s gotten better under the new administration, but it’s real. We don’t face those burdens in other places. And then finding the right skilled workforce has been problematic. In 2014, for example, we were paying almost $100 an hour to bring people up from all over the country to assemble vehicles in Roseau, Minnesota. It’s a small, rural community and we just could not find workers. In many of our communities we partner with the local high schools. We actually donate welding machines to the high schools so that we can train people to be ready to be employees at Polaris. That’s a little bit of the way we get ahead of the curve. Airstream: Younger folks in the U.S. are not really targeting manufacturing as a career. That’s a challenge, just trying to make sure the younger generations are as good as the older generations at building things, because we’re such a handcrafted product.